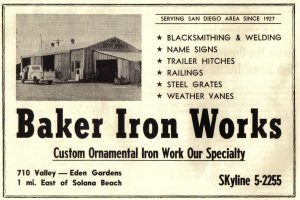 Solana Iron Works was operated by Charlie Baker, the blacksmith, and Sam Lank who was a machinist. Artisans like Charlie Baker are now few and far between. Charlie could fabricate anything out of iron on his large presses which he operated by pulling a lever and which stood on fairly small concrete bases. He also had a forge and with his huge hands he could pound out anything on his anvil. 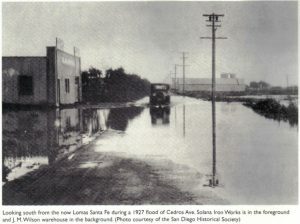 Charlie lived on Sierra Street, north of the hotel, in a stone house. Mr. Lank lived on Rios. When Mr. Lank retired, Charlie renamed the company Baker Ironworks and moved the business to Valley Avenue in Eden Gardens.